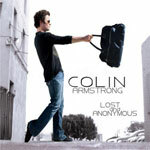 CD review: "Lost and Anonymous"
This review first appeared in the January 3, 2008 issue of the North County Times. Although now living up in L.A. working whatever music biz connections he has, Colin Armstrong is a native San Diegan who relocated only a few months ago. What is apparently his debut CD arrived in the office last summer, and quickly grabbed our ears with its upbeat, melodically intoxicating power pop. We kept waiting for him to schedule a live show so we could interview him, but that never happened. Still, "Lost and Anonymous" has never moved far from our CD-ROM drive, and has made repeated visits to the active playlist in iTunes. Intelligent lyrics, strong singing voice, decadent melodies  it's adult pop for the young at heart, is what it is. If those L.A. connections work out, ear candy like "Touch," "Brand New Day" or "Same Old Story" may well end up all over your radio.